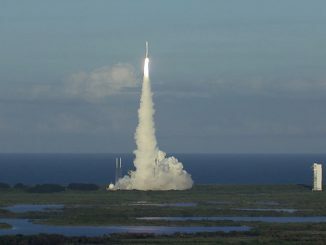 Sending the OSIRIS-REx spacecraft on an interplanetary trajectory to Asteroid Bennu, a United Launch Alliance Atlas 5 rocket thunders away from Cape Canaveral Thursday at 7:05 p.m. EDT (2305 GMT). 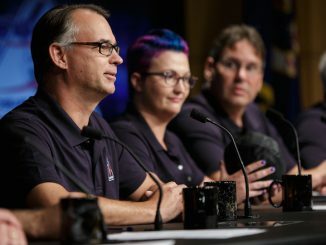 An hour after OSIRIS-REx separated from the United Launch Alliance Atlas 5 rocket on its trajectory to Asteroid Bennu, officials from NASA, the University of Arizona, ULA and Lockheed Martin held the post-launch news conference from Kennedy Space Center. 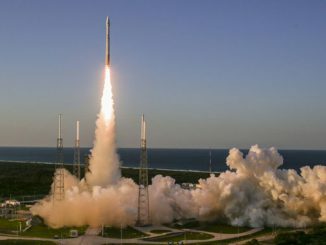 Like reaching back in time to examine the conditions that existed in the ancient solar system, NASA has launched a robotic probe to visit Asteroid Bennu and return an unspoiled sample of the primitive body that may hold the seeds of life. 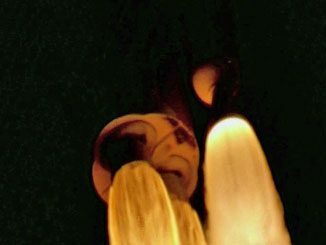 The United Launch Alliance Atlas 5 rocket, standing 189 feet tall and and weighing 840,000 pounds, unleashes 1.2 million pounds of thrust from its main engine and one side-mounted booster at 7:05 p.m. EDT (2305 GMT) today to launch NASA’s OSIRIS-REx mission to Asteroid Bennu. 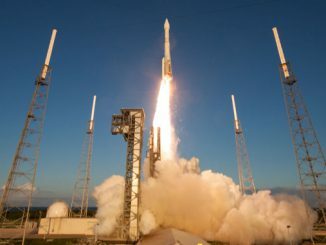 The United Launch Alliance Atlas 5 rocket lifted off from Cape Canaveral at 7:05 p.m. EDT (2305 GMT) today to send NASA’s OSIRIS-REx spacecraft on a seven-year, 4.4-billion-mile mission to rendezvous with Asteroid Bennu and bring a sample of the primordial object back to Earth. Follow the mission in our live journal. 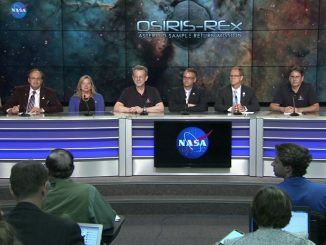 The scientist in charge of NASA’s OSIRIS-REx mission hopes to apply more than $30 million in leftover funding toward reducing the risk of the probe’s touch-and-go maneuver to snag a piece of asteroid Bennu, then eventually hire more experts to analyze the primordial specimens when they return to Earth in 2023. 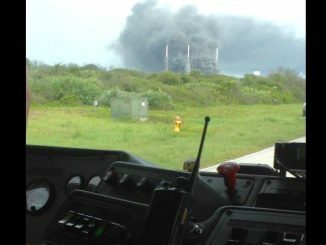 Headed to a relic from the solar system’s formation over four billion years ago, NASA’s OSIRIS-REx sample return craft was moved to Cape Canaveral’s Complex 41 launch pad today in preparation for liftoff Thursday aboard an Atlas 5 rocket en route to Asteroid Bennu hoping to find the seeds of life. 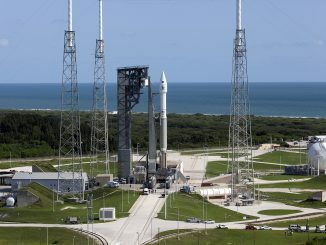 Poised to embark on a 7-year adventure to Asteroid Bennu and back, NASA’s OSIRIS-REx sample return spacecraft was moved to the launch pad today aboard its Atlas 5 rocket for liftoff Thursday evening. 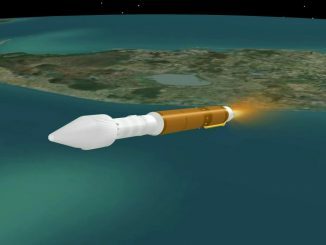 Follow the Atlas 5 rocket’s ascent from Cape Canaveral’s Complex 41 launch pad to send NASA’s OSIRIS-REx on an interplanetary trajectory to intercept Asteroid Bennu and bring back a pristine sample. 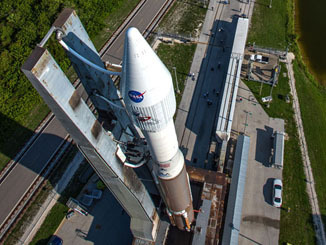 Launch is scheduled for Thursday at 7:05 p.m. EDT (2305 GMT).